Eocoronidae is an extinct family of insects from the Carnian age of the Triassic period. 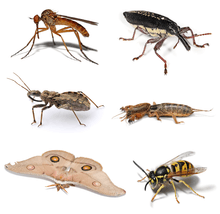 It was established in 1981 by the Australian entomologist Norman Tindale. At present, it contains only one species and genus: Eocorona iani. The taxonomical placement of Eocoronidae is unclear. Originally considered to belong to the order Lepidoptera, it is now assumed to be basal and is classified under Amphiesmenoptera. Fossils of Eoses triassica, previously classified under the monotypic family Eosetidae and subjectively synonymized by E.F. Reik into the mecopterid species Mesochorista proavita, has been proposed by Tindale to belong to this family. ↑ "Eocorona Tindale, 1980". Butterflies and Moths of the World Generic Names and their Type-species, Natural History Museum. Retrieved July 14, 2011. ↑ Niels P. Kristensen (1998). Handbuch der Zoologie: eine Naturgeschichte der Stämme des Tierreiches. Walter de Gruyter. p. 16. ISBN 978-3-11-015704-8. ↑ I. F. B. Common (1990). Moths of Australia. BRILL. p. 76. ISBN 978-90-04-09227-3. ↑ R.A. Crowson; W.D.I. Rolfe; J. Smart; C.D. Waterston; E.C. Wiley; R.J. Wootton (1967). "Chapter 19: Arthropoda: Chelicerata, Pycnogonida, Palaeoisopus, Myriapoda and Insecta" (PDF). The Fossil Record. Geological Society of London: 499–534. Retrieved August 11, 2011. ↑ E.F. Riek (1955). "A Re-examination of the Mecopteroid and Orthopteroid Fossils (Insecta) from the Triassic Beds at Denmark Hill, Queensland, with Descriptions of Further Specimens" (PDF). Australian Journal of Zoology. 4: 98–110. doi:10.1071/zo9560098. Retrieved August 11, 2011. ↑ Norman B. Tindale (1980). "Origin of the Lepidoptera, With Description of a New Mid-Triassic Species and Notes on the origin of the Butterfly Stem" (PDF). Journal of the Lepidopterists' Society. 34 (3): 263–285. Retrieved August 11, 2011.